In their endless quest for powerlifting Nirvana, many of today's athletes are employing increasingly sophisticated training techniques, interweaving the related disciplines of kinesiology, physiology, nutrition, bio-feedback theories and the like. As the levels of competition intensify with each succeeding year, platform savvy, hard work and luck just aren't enough. Proper application of time-tested theories will garner the athlete faster gains and greater success than before. In the midst of this maelstrom of information hurled at the power athlete, one tends to forget the old 'standbys' of yesteryear which have as much or more applicability in today's high-tech powerlifting world. This month's feature will 'touch' on one of the most effective methods of breaking nagging sticking points, of literally blasting through the mental 'number' barriers (i.e., a 400-lb bench press) and of significantly increasing the level and quality of musculature on the athlete. This method has applicability in both powerlifting and bodybuilding as well having some crossover effectiveness in related strength sports (weight throwing, football, wrestling, etc.). The method that I have been alluding to is the venerable 'Forced Reps' system. Yes, we all have probably picked up a copy of an old Muscle Builder magazine where the Weider methodology was espoused. Throughout the endless 'tri-sets' and 'blitzing' the Weider principle of forced reps is by far the most useful of the lot. I have had the good fortune to train on quite a regular basis with two of the best powerlifting minds around, Roger Estep and George Frenn. They have taken the original ideas of forced reps and turned them into a sophisticated, very workable training method that can be used by all athletes. In light of today's increasing emphasis towards drug-free competition, forced rep training, or as Roger calls it- the 'hands on system' - is a real boon to those not wanting to rely on the friendly neighborhood pharmacy for his or her gains. The physiological theory behind forced reps is quite simple. Basically, it takes the Overload Principle, an idea gleaned, incidentally, from the German weightlifting team in the Los Angeles Olympics of 1932 by the U.S. coach Mark Berry, and it carries it to the ultimate end. During a maximum attempt almost all of the muscles and nerve endings are 'firing' simultaneously in order to achieve the lift. If there is a psychological barrier due to a prior injury or because the weight is now in a 'magical' area (usually the even numbers such as 300, 400, 500 etc. are responsible for this), signals from the stress receptors will be allowed to overload the 'system', like a common circuit breaker, and shut it down; and the lift will be missed. 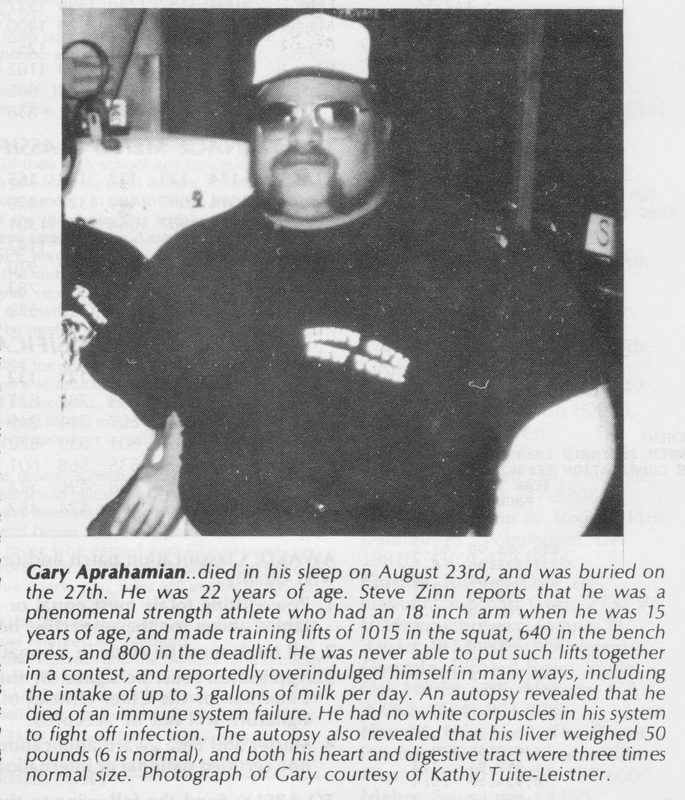 As an example, we all know the lifter who can literally 'vaporize' 290 lbs on the bench press. The weight flies to arms' length as if the discs were made of balsa, not cast iron. Yet, place a mere 10 lbs more weight on and suddenly the Burden of Ages seems to be on the bar and the lifter gets crushed with the attempt. Ridiculously enough, if this same lifer's workout buddy surreptitiously puts an extra 20 lbs on the bar and doesn't tell him, he may do much better in the attempt. Prudent usage of the 'Hands On' system will ensure that these mental barriers will not crop up at unwanted times. Back to the 300 lb (or aspiring to 300 lb) bencher, and let's take him through a typical Estep-Frenn bench workout. Warmup: 135 x 10 x 2 sets. The lifter should not be afraid of extra warmups as the system in the initial phases can be quite strenuous. Make sure the shoulder/pec area is warm and loose. Initial Work Sets: 225 x 5, 250 x 3, 270 x 1. Notice the lack of reps in this initial phase. Not to worry, people, the real work ain't started yet! The 270 x 1 should be a cakewalk set, something along the lines of an opening attempt under any condition. Heavy Core Sets: 285 x 1, 295 x 1. Naturally for a 300 lb (or close to it) bencher, these two sets should be tough, but workable. Hands On Sets: 305 x 1, 315 x 1, 330 x 1. How about that! Now we are really sailing on uncharted waters, but there is a right and a wrong way to perform the 'Hands On' technique of bench pressing (as there are with the other two powerlifts). Roger likes to place the first two fingers of each hand on the bar when he's spotting an attempt and HOLD THEM THERE THROUGHOUT THE DURATION OF THE LIFT. This is important because a lot of people literally 'dump' the weight on a lifter and then come to their rescue with the forced reps. From my experience training with Roger, it is very important for the lifter to feel that he or she is in CONTROL throughout the whole lift. The eccentric or negative phase of the lift is, therefore, important. Another method we can use can be called the 'fist' method where the spotter lifts the weight off with the fists close together so that when the lifter comes down the spotter's fists actually make contact with the lifters chest. I like this method because it imparts an even greater sense of psychological confidence in the area of 'uncharted waters'. As Roger is fond of saying, "Don't let the weight control you . . . be aggressive at the bottom." The proper interaction between spotter and athlete is very intricate. I doubt very seriously if one could grab the usual gym mullet and expect him to give you proper 'Hands On' with a 380 pound bench. In most instances the uninitiated will treat this as an Olympic lifting High Pull and the lifter loses about 90% of the benefit. LET THE LIFTER DO THE WORK. One has to be very careful or the Hands On system could be a giant ego lift and nothing more. Warm Down: 290 x 1 paused, 240 x 10. The 290 should be without 'hands' and the 240 should be touch and go. This system should be worked once per week. Naturally during the early phases of training, extreme muscular soreness will occur. Do not be overly concerned as this is the manner in which the body acclimates itself to stress. On the second bench day do several sets of 5 reps, and if you feel strongly do a triple. Yes, you can cycle the Hands On system. Suppose you start with a 300 pause and a 340 hands on. As your Hands On lifts increase, so should your paused attempts. Naturally the inevitable plateaus will come and go. One can not, in my estimation, use the Hands On method for 365 days of the year and certainly not for 465 days a year, except in rare cases involving mirrors, reality cracks and/or long, late-night mental battles with tortured terrorists posing as people made of provolone. So, not to be used every session, but still playing a major role in the lifter's training. 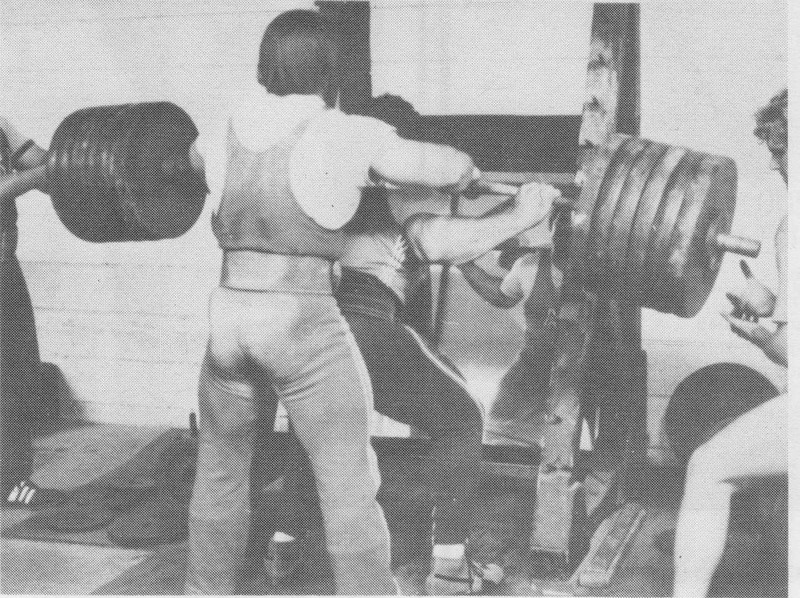 In the squat, the same principles can apply, but the spotter has the option of holding the bar or the waist of the lifter. Many times we will go to a normal single with say, 560-580 and then pile on 20-30 more pounds for a Hands On treatment. Again, the spotters for the squat in a Hands On situation should be damn proficient, especially the 'anchor' (the spotter immediately behind), or the local orthopedic surgeon will get lots of business and be able to pay off that new Porsche of his. Many times if you use the same anchor spotter in the meet as you do in training you 'sense' that his hands are still on the bar! Strange though it may sound, this constant conditioning can literally play a trick on your mind and almost eliminate the resultant fear when going down into a full squat. In the deadlift, I feel that this method has the most applicability. Spotting for the big pull is a bit trickier, so careful attention to detail is important. Regardless of which style (sumo or regular) the athlete assumes, the spotter should stand behind, literally crowding the lifter. By placing the hands - one at the base of the sternum and the other at the tailbone - an extreme feeling of tightness is imparted. However, the lifter will be doing the pulling. Additionally, this will keep the lifter in the groove and prevent any old injury from cropping up if the body gets out of place. If one feels really brave, don a pair of straps and try the Hands On with the deadlift. I guarantee that you will pull weights beyond your wildest expectations. In closing, you should remember to use the Hands On approach like you would use Tabasco - a little goes a long way. Give it a try for six to eight weeks. 250 x 5 x 3.